There can be a lot of things to keep track of while travelling for business – flights, hotels, expenses, business meetings, and not to mention communicating with colleagues and loved ones back home. Instead of worrying about managing every part of your trip, why not let your smartphone help you? 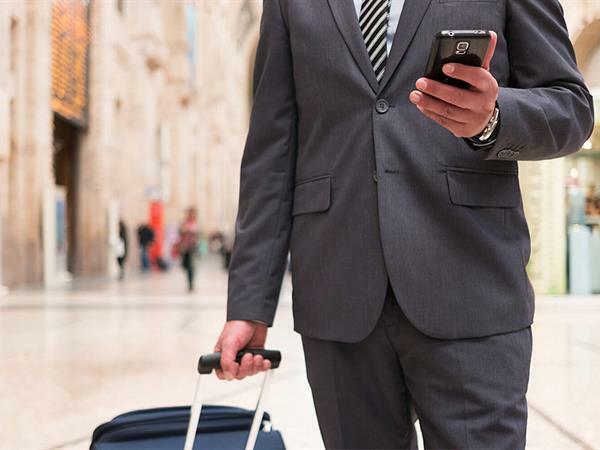 The following is a list of apps designed to help make your business trip as easy and as stress-free as possible. TripIt is the ultimate business travel companion. The app keeps all your travel information in one place including flight, hotel and restaurant bookings, car rental details, meeting schedules and whatever else you need for your trip. All you have to do is forward your confirmation emails to your TripIT account and your entire trip itinerary is organised into an easy to read calendar. The app also allows you to view weather updates, as well as restaurant and hotel recommendations. FlightAware is a free app that allows you to track the progress of your flight (in real time) and provides updates if there are any delays or changes. Having access to this information allows you to alter any arrangements you have made for when you land, such as pushing back pick up times and meetings to account for the delay. It also means you can plan work to complete while waiting to board. When looking for flights, Hopper helps you find the cheapest flights possible. Simply enter your travel dates and the app will predict when the best time to buy is. You’re then either recommended to purchase straight away, or told to wait. The app will keep track of the flight and send you a notification when the price drops. It’s free to use and is available for both Android and IOS. If you haven’t had time to book accommodation before your trip, it’s not a problem if you have the free HotelTonight app. When you land, the app will scan the area and find you last minute hotel deals that you can book on your phone, giving you one less thing to worry about when planning a last minute trip. This free app is used for expense management while you’re travelling. Concur allows you to take a photo of your receipts or import data from your credit cards so you don’t need to worry about keeping any paper receipts. You can then send reports to your employers via the app for approval and any reimbursements. Business may take you to foreign countries where English isn’t the dominant language, so consider downloading a translator. iTranslate, can be used to translate text, start voice conversations, and search the definition of words in over 90 languages. This app can be used for communication during international business meetings or for help with reading things like street signs and restaurant menus. One of the most useful apps when you’re overseas, Google Maps, can help you navigate anywhere – from finding your hotel or meeting point, to finding the nearest petrol station or cafe. As mobile data is expensive when used overseas, you probably won’t be using your mobile internet while travelling. The benefit of Google Maps is that you can use you hotel WiFi to plan your route and it will stay on your screen even after you lose your internet connection. Finding parking in city areas is always a challenge, particularly if you don’t know the area well. If you’re renting a car, Parkwhiz will help you find parking spaces in secure garages or parking lots in 160 different cities around the world. You’re able to then reserve a spot in advance to ensure you have a guaranteed place to park on the day. Alternately, if you’re not renting a car then you will need a way of getting around during your stay. Uber is a reliable ride share app that allows you to book a ride last minute, track the car on your phone and pay via the app. There’s even an Uber for Business app that companies can use for their employees anywhere in the world using the company’s business profile. While you’re overseas or interstate for business, you may wish to indulge in the culture and food of the city, or may be looking for a good dining spot to host a meeting. Yelp helps you find restaurants, cafes, bars, and food delivery services, and also provides customer reviews and menus to help you make an informed decision. When travelling for business you may not have access to all the devices you usually would while sitting at your desk. Evernote is perfect for taking notes during business meetings away from your office. You’re then able to sync the app across other devices, allowing you to access them at any time, so you’re not at risk of losing all your work. The app is free to download to your devices. Google Drive is ideal for business travel as it allows you to collaborate on work with your colleagues from opposite sides of the world. Anyone with access to the document can edit and share it and your work is automatically stored as you go, so there’s no risk of losing unsaved work. Documents are stored on Google Drive so you don’t need to have an documents saved to your devices either. While you’re travelling, business at home doesn’t stop and you need a way to stay up to date with team tasks. This free app allows you to view the progress of your team at home by providing a platform for assigning tasks and tracking deadlines, as well as access to shared documents. Another way to communicate with colleagues at home is through Slack. The instant messaging app is free to download to your IOS or Android device and is a good alternative to email as it allows you to send real-time private and group messages as well as share documents and images instantly. If you use any services like Google Drive or Dropbox, just paste the link into Slack and that document is archived in Slack and is able to be accessed later. Slack also offers the option to make voice and video calls. Skype is another great communication app to have while travelling for business as it can be used for both business and personal purposes. If you’re missing your family and friends, you can use Skype to video call them free of charge. It also has an instant messaging feature you can use to keep loved ones informed of your travels. And if you’re missing any meetings with clients or colleagues while you’re away, you can use Skype to remotely join meetings through video conference with up to 10 people at a time. With so much to organise, from flights and accommodation, to meetings and staying in touch with work back home, travelling for business can become a hassle. With a bit of help from these apps, you can streamline some of the processes involved in organising your travels and make your trip a whole lot easier.